Growing Carrots – How To Plant And Grow A Great Crop! 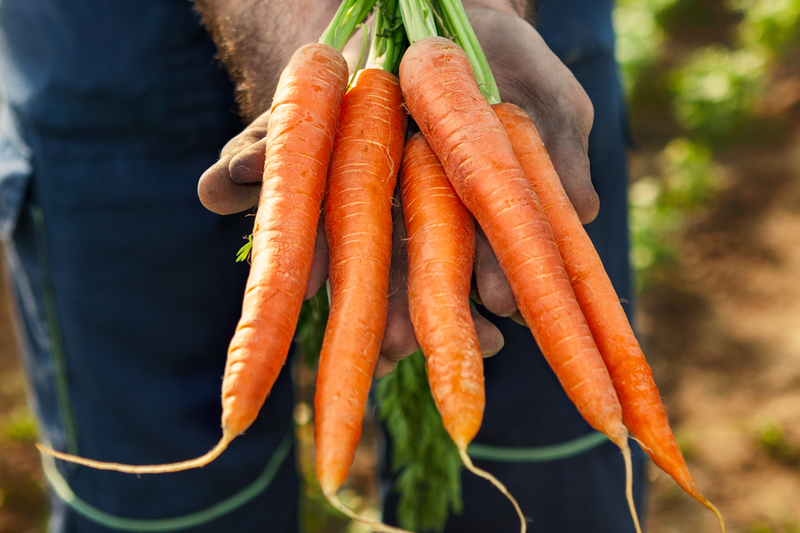 Growing carrots isn’t really all that difficult if you pay attention to one important thing – the soil! The key to growing carrots successfully starts and begins with the dirt they are grown in. Carrots need loose, fertile, well-drained soil to flourish. Give them great soil, and they grow strong, straight and true. Plant carrots in poor, dense, hard, or clay-like dirt, and they will struggle. More likely than not, you’ll be left with stunted, misshapen vegetables that resemble a tooth more than a traditional carrot. Carrots can be grown in a traditional garden setting, raised beds, or even in containers if the vessel is deep enough to allow the seed to develop fully. In a garden setting, carrots should be seeded in rows, allowing at least 2″ between plants. It is best to plant seeds every inch or so to ensure germination, and then thin to 2″. If planting in raised beds or containers, allow at least 2″ in any direction between plants. However you plant, give them as much sunlight as possible. Although carrots can grow in partial shade, they will perform better with more light. Carrots germinate slowly, some varieties take as long as 2 to 3 weeks to poke through the soil. Water the soil every few days to keep it from drying out. Carrots need loose, fertile soil to thrive. Once seeds have germinated, mulch with a few inches of straw or compost to keep weeds at a minimum. Carrots compete for nutrients in the ground, so don’t allow weeds to steal away valuable resources. Depending on the variety grown, carrots can be ready for harvest in as little as 10 to 16 weeks. They can be harvested at any point, although allowing them to grow to at least 1/2 to 3/4 inch in diameter is best. Carrots do much better in cooler weather. They can be planted in early spring for an early summer harvest, or in late summer for a late fall harvest. In the fall, a few frosts will actually improve the flavor of the carrots before harvesting. A rainbow mix of carrots. Atomic Red Carrots – The deep red color of Atomic Red carrots make them a showstopper on the dinner table! Atomic Red’s are also chock-full of healthy vitamins, and contain high amounts of lycopene too. Scarlet Nantes – This well-known, traditional carrot is easy to grow, and produces 6 to 8″ bright orange carrots. Scarlet Nantes will mature in about 65 days, making it perfect for both spring and fall planting. Rainbow Mix Carrots – Want to grow a colorful mix of carrots? Then a Rainbow carrot mix is your answer. This seed mix will give you a beautiful array of red, purple, yellow and orange carrots that will fill your dinner plate with color. Want to showcase your backyard garden or gardening tip on This Is My Garden? Email us today at info@thisismygarden.com, and you might be our next feature! Growing Zucchini – How To Grow This Super Summer Squash With Ease! Growing Brussel Sprouts – How To Plant And Harvest This Nutritious Crop!